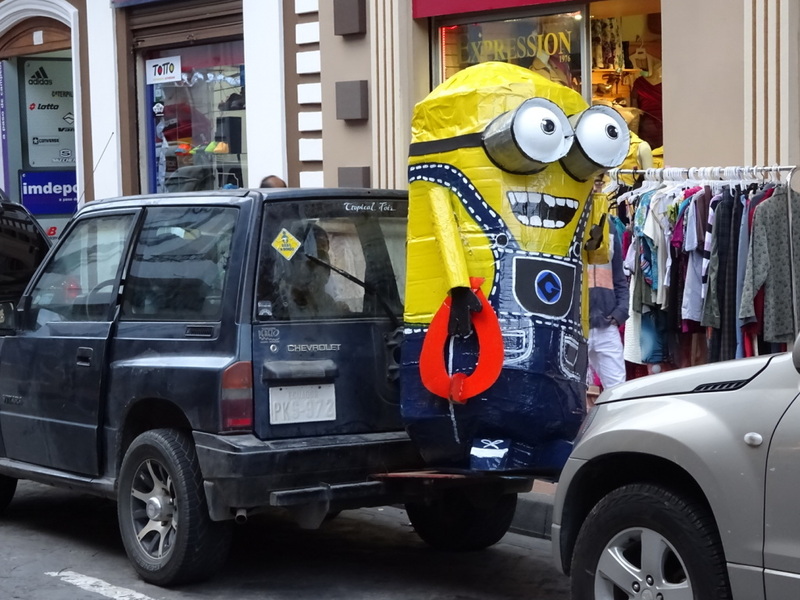 Posted on January 1, 2015 by No Map Required Posted in Ecuador, Places	. 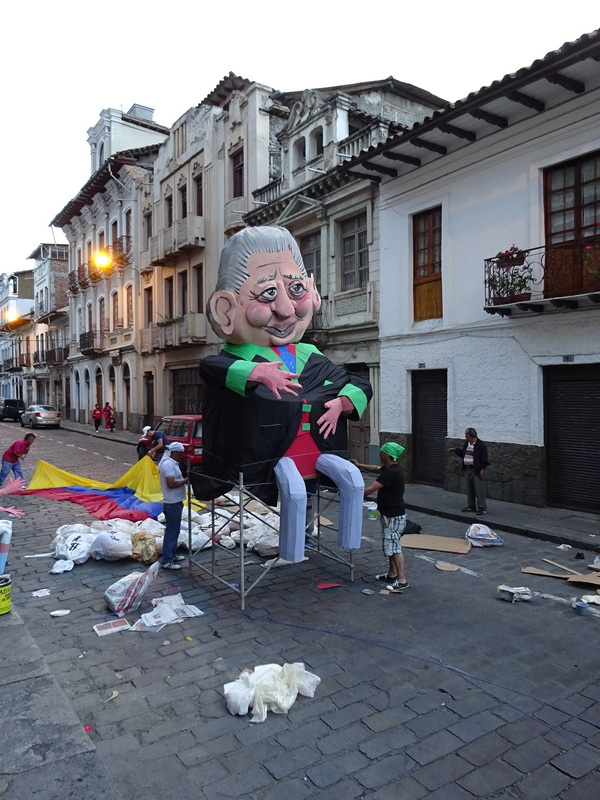 It’s just 9:00pm and we are back from downtown Cuenca with a quick NYE report. 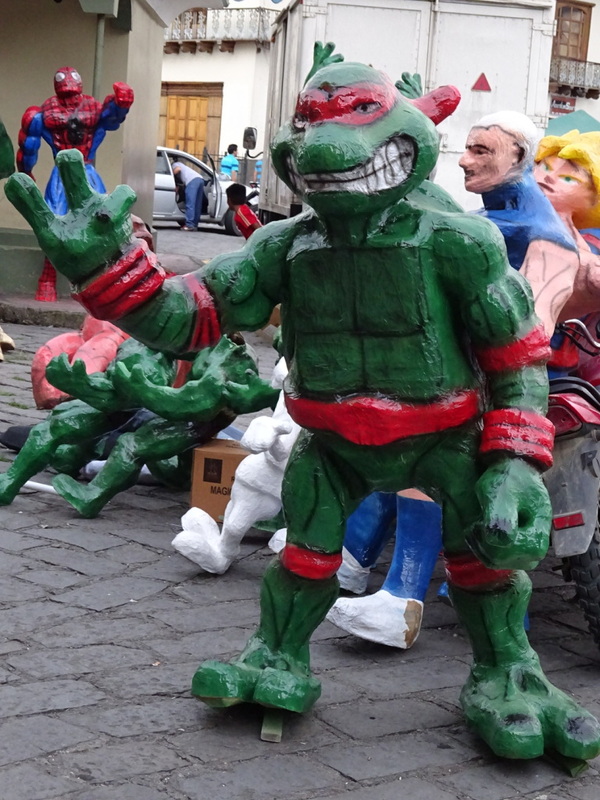 First, it feels like there are more effigies out there than people! It’s just crazy, with a wonderful festive vibe – definitely not as creepy as we originally felt. 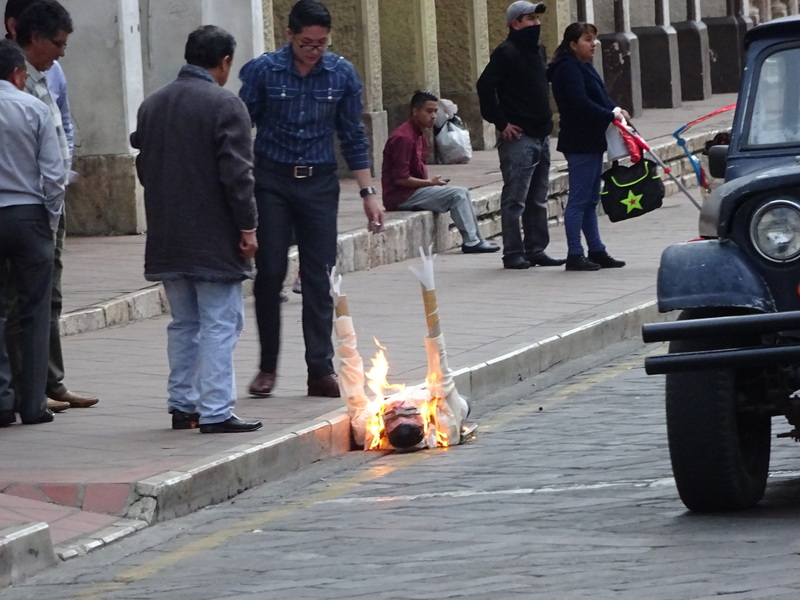 Cuencans burn effigies to get rid of the bad from the old year so they can start fresh in the new. They might purchase a scarecrow kind of effigy and a unique mask to put on it or an effigy that looks like a superhero. Not entirely sure what it means to burn Captain America or a Minion or a Pokemon character, but they seem popular. 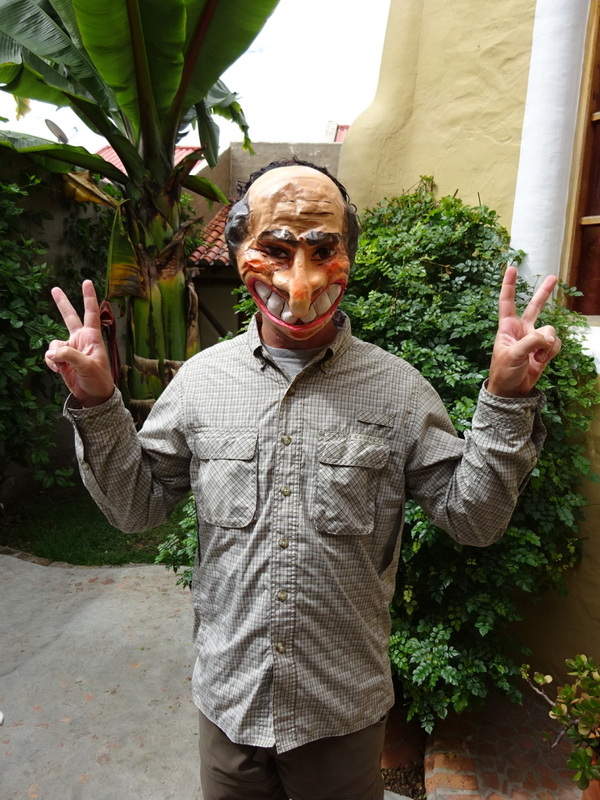 Masks are for sale on every street the last week of the year – a mix of homemade and plastic. We watched as people put their effigies on the side of the road, lit them, took pictures, stood around and watched them slowly burn. Did I mention that many of them have fireworks in them? As the cars drive past on the cobblestone streets, the fire crackers start popping and hissing next to the cars. I admit to jumping a time or two myself! See? Just burn ’em at the side of traffic – no problem. In a second: Kaboom! The fireworks start to go. A couple other interesting observations. 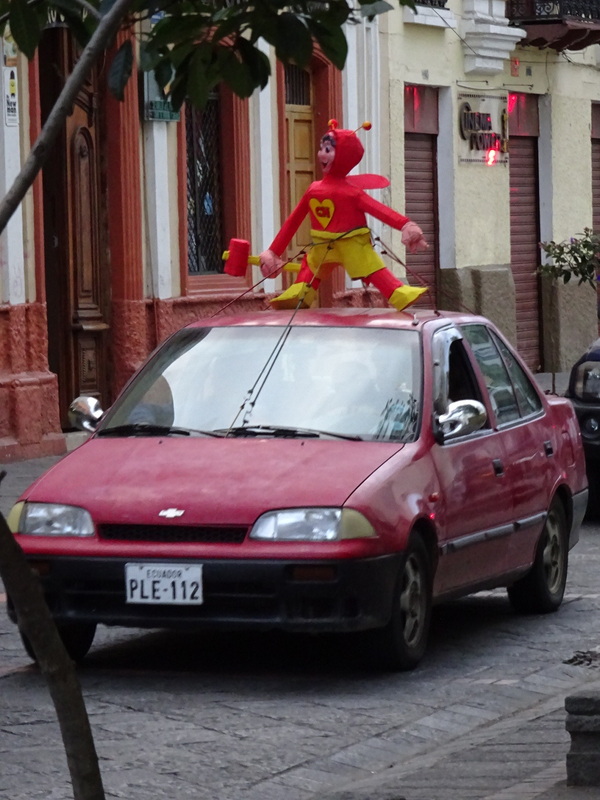 People have been driving around town with effigies tied to the hood or roof of their cars all week. 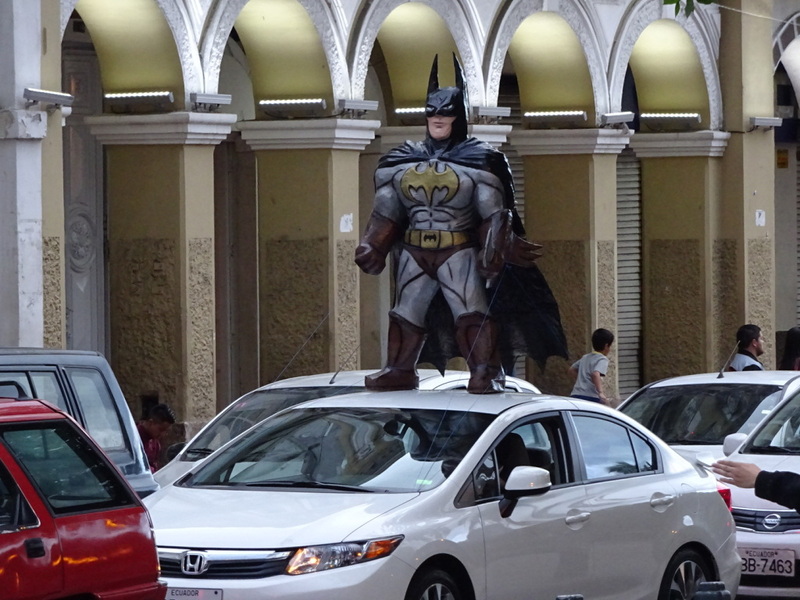 It’s fun to see Batman coming right at you. In quite a few spots entire tableaus made of effigies were going up. We assume they burn the whole thing but we went home too early to find out. Also, tonight brought out tons of young men dressed in drag all over town stopping vehicles and asking for change. It’s a bit Rocky Horror and definitely unusual, though harmless! Okay! Everyone, have a fabulous New Years. Photo-time! 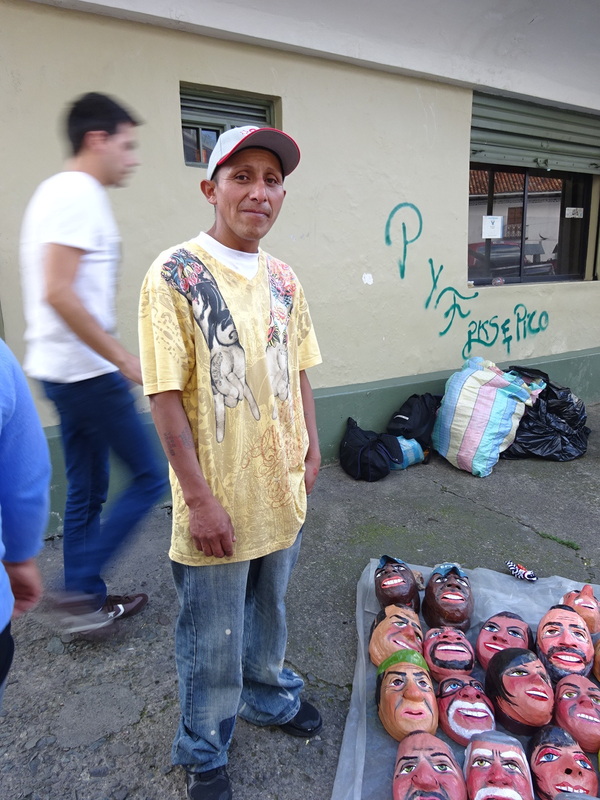 This man and his family make thousands of the masks to sell each year. 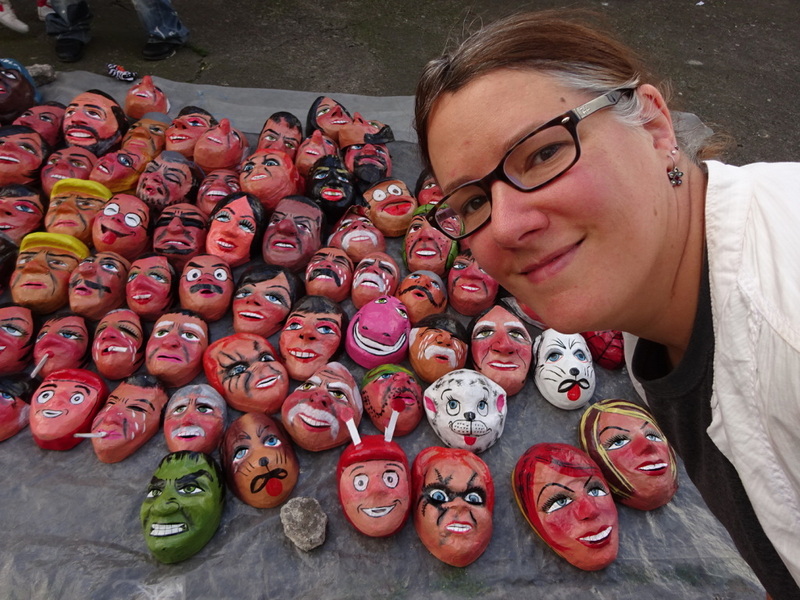 Anner picking a mask or two. Blank effigies for sale on the corner. 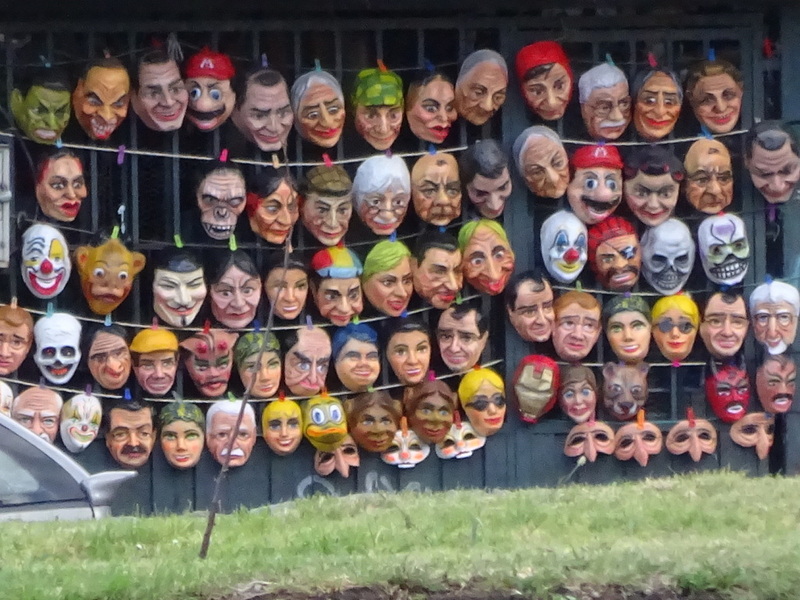 Choose a mask that looks like yourself or someone you’d like to have the bad previous year burned away from, and you’re good to go! 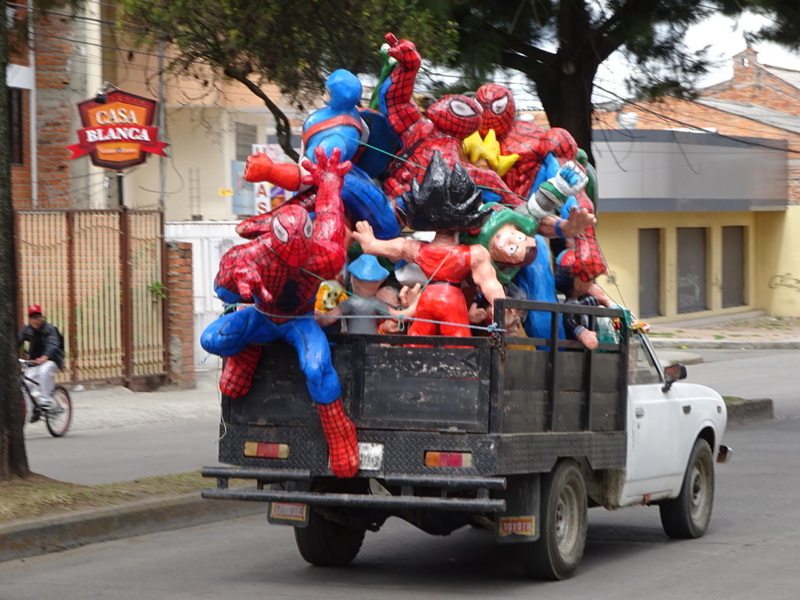 Lots of effigies were tied to cars and we saw bunches of backseats filled with whole families of effigies. 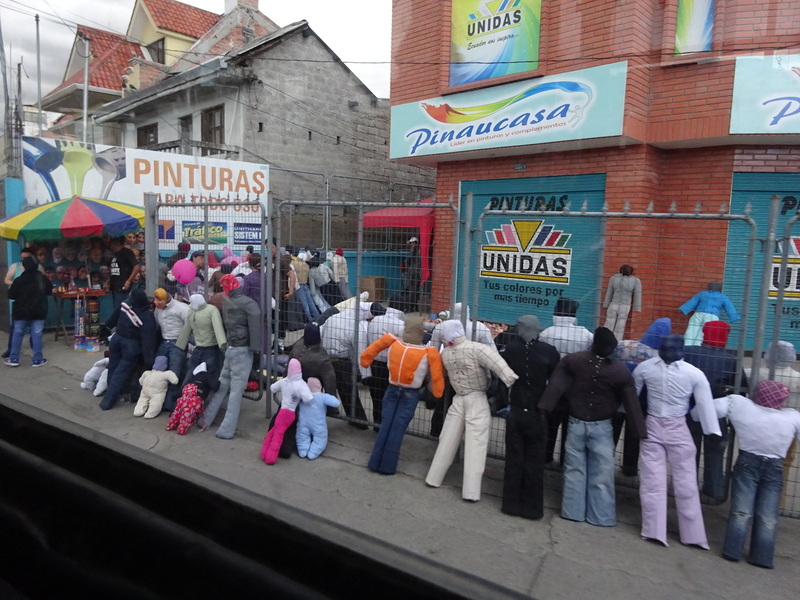 Fancy effigies for sale in one of the many squares in the historical part of town. Not sure what it is….but we liked it! The start of a tableau. The tableau a little later on. 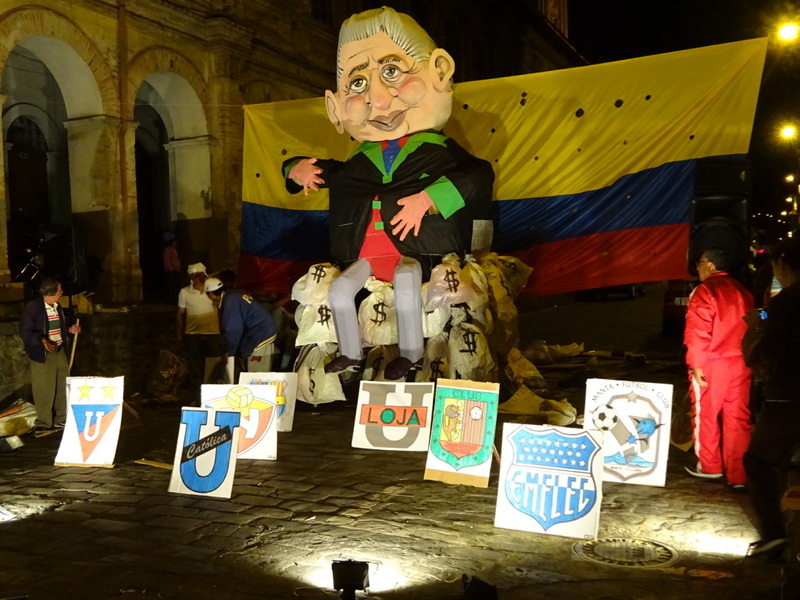 This one had to do with certain futbol teams (the logo signs) and, obviously, money. 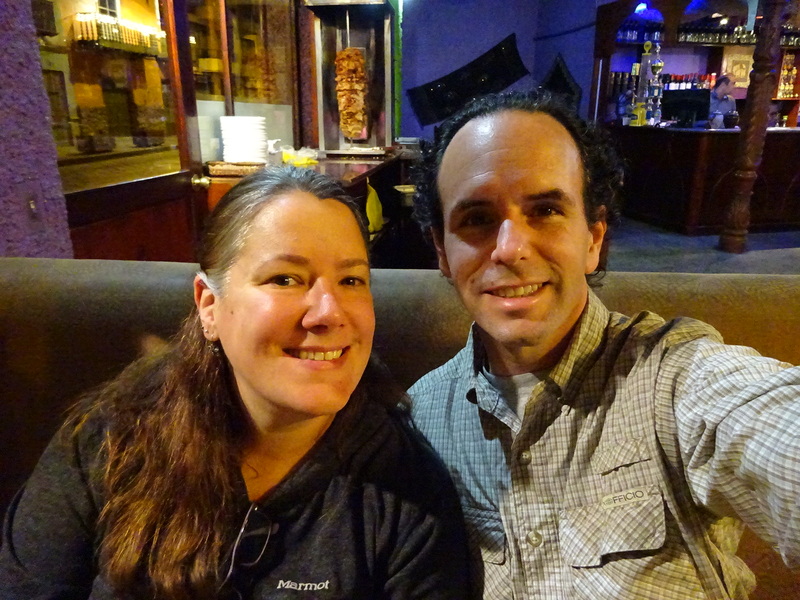 Out for a “fancy” dinner with my honey. 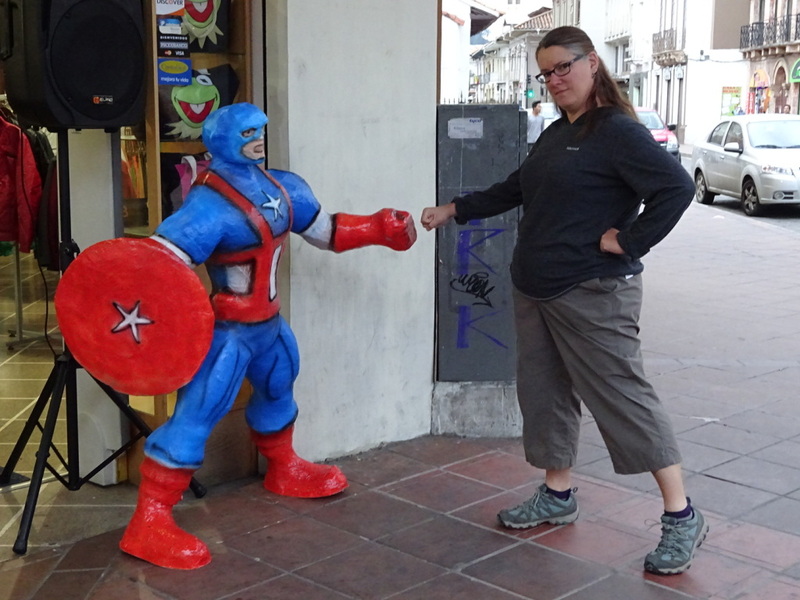 You thought Captain America would be bigger? Ha! Remember who is taking him on in the photo. It’s obvious who the real superhero (super heroine?) is. Dean looooooooves the comic book effigies! Us too, Dean, us too!! !